"Do you twist your hair yourself?" Year 3 as a Natural for Me! Do Black Women use Men Ask An Excuse For Relaxers? "ain' you African? 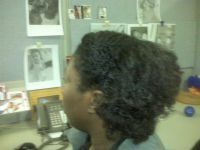 you should be praising the naturals"
Twistout: How can I keep the ends from being super-frizzy on first day? Why is my hair coming out?!? sheamoisture curl enhancing smoothie & Sheamoisture Curl and style milk. Is Bee Mine's Curly Butter JUST Shea/Aloe? Please help me? I'm clueless! All Natural and Loving It!! Should I apply a leave-in before I blow dry? Any Good Natural/Curl/Ethnic Stylists in Nor Cal? How to apply gel properly?